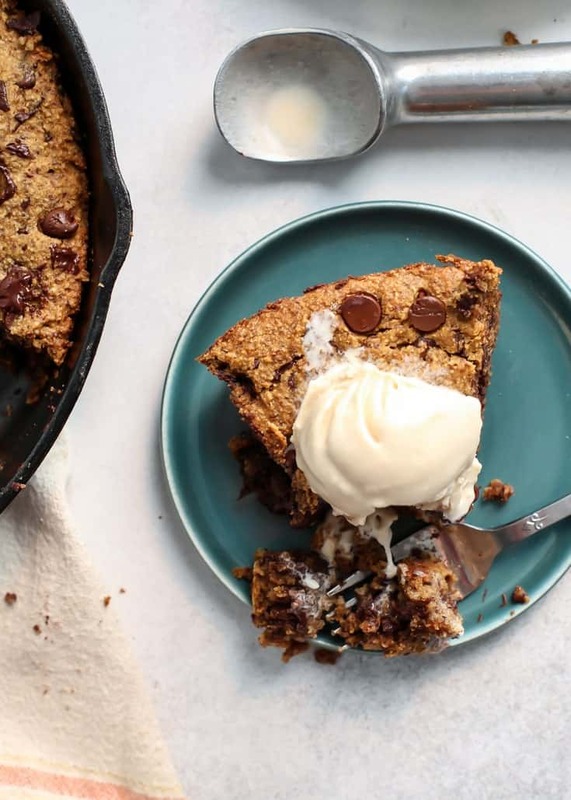 A Paleo Deep Dish Chocolate Chip Pumpkin Cookie Skillet. Perfect for a crowd. Made with grain-free flour, cashew butter and real pumpkin. This dessert is going to blow you away! Dairy-free, gluten-free, paleo. Do you ever get a hankering for a deep dish cookie? …No? Just me? We’re talking DEEP DISH CHOCOLATE CHIP PUMPKIN COOKIE. I mean… Does life get any better than this?! Why deep dish? Is that even a question? Deep dish > shallow dish. Alright that was dumb. Moving on. In all seriousness – I love my darling little single cookie skillets… except when they’re gone, they’re gone. 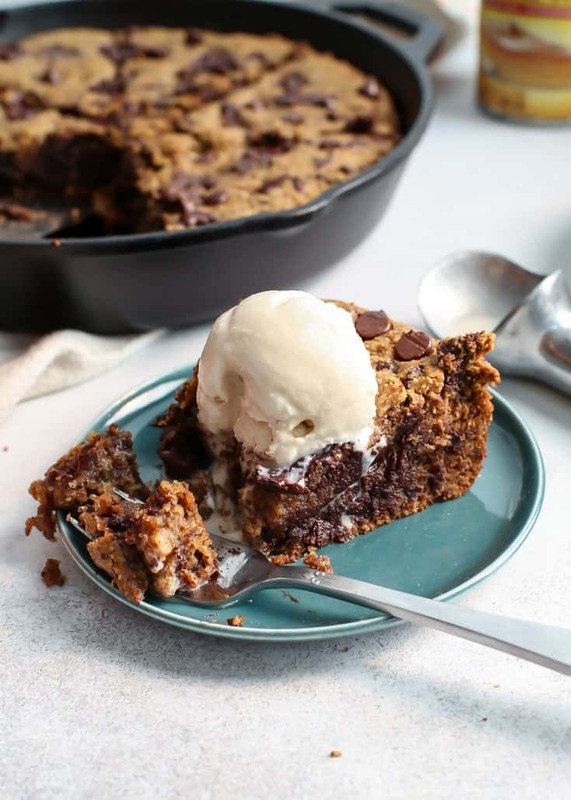 And then you’re left the next evening wondering if you should have made 5 mini skillet cookies so your desserts would be set for the rest of the week. So I made this deep dish pumpkin cookie with Drew in mind, plus all of other SOs that don’t want to share desserts and would like the option for seconds 🙂 Alright, myself included in this. It would also be a lovely dessert to make for a large gathering. Maybe you cut giant pumpkin cookie slices, or maybe you keep them on the smaller side. I don’t judge. I used my stand mixer for easier mixing but you can also use one large bowl and an electric hand mixer. I do recommend an electric mixer of some sort if you have one, to help ensure all the wet ingredients get combined well–especially the nut/seed butter. My cashew butter was pretty thick and using the paddle attachment of my stand mixer helped make sure it combined well with the oil and sugar. 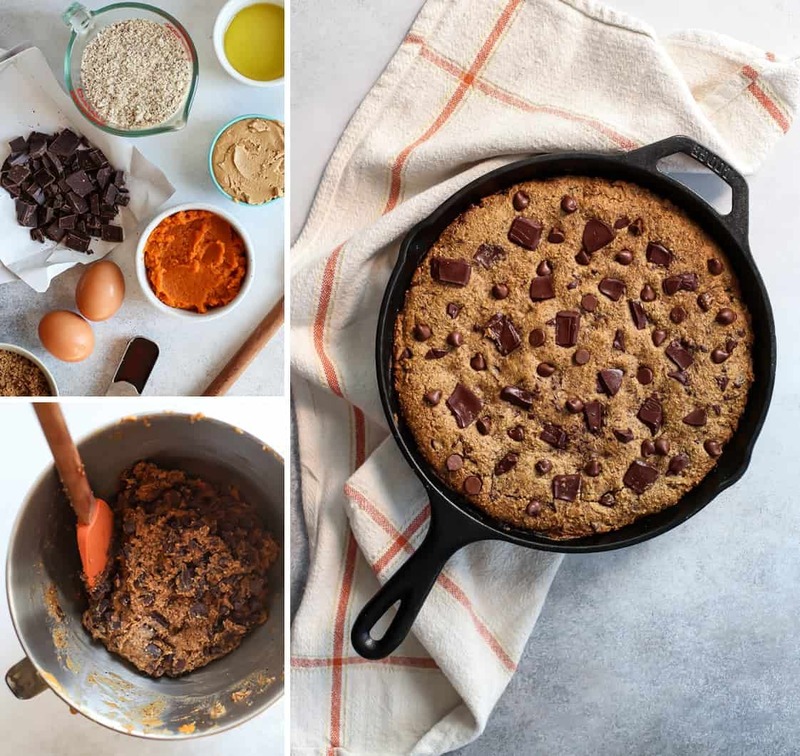 Once the ingredients are all combined you simply transfer the pumpkin cookie batter into a greased 10″ skillet. I used a cast iron here, but you could likely use a deep dish pie plate or even a 10″ round cake pan with removable bottom – like this one. Some notes on the flour! I used almond meal here, but I also tested this mini pumpkin cookie skillet with cashew flour. So I think cashew flour would work here in this recipe too. See this post on how to make cashew flour–it’s as simple as blending raw cashews in a blender or food processor. The most challenging part of this whole process is letting the pumpkin cookie rest a bit before slicing into it. It’s not that you have to wait too long, but it feels like torture when all you want to do is DIVE IN. 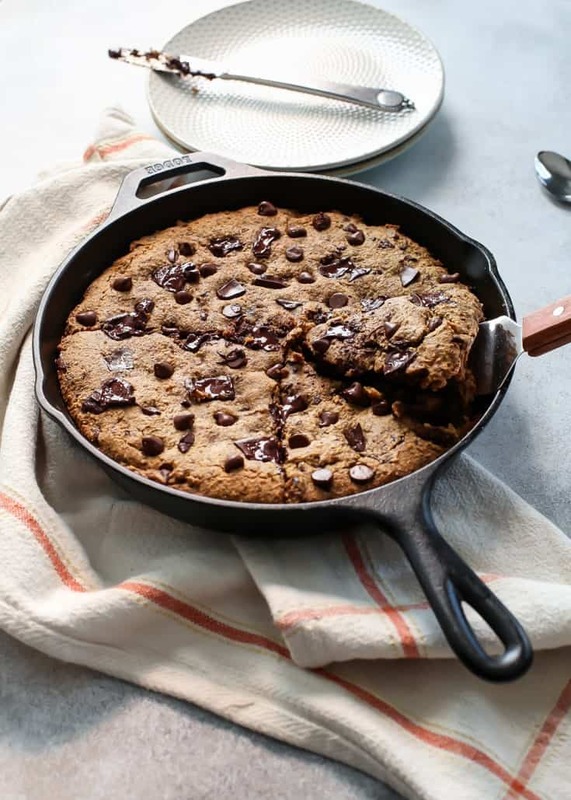 But allowing the skillet to cool will not only ensure you don’t burn your mouth (been there, done that) it will also help the cookie slices hold together better when sliced and served. I hope you guys love this as much as we did! Preheat oven to 350ºF. Grease 10″ cast iron skillet**** with butter or oil. Set aside. In large bowl add cashew butter, oil and coconut sugar. Use stand mixer paddle attachment or electric mixer and beat together for about 1 minute, or until thoroughly combined. Add in maple syrup, pumpkin, eggs and vanilla extract; mix until thoroughly combined. Add in almond flour, pumpkin pie spice, baking soda and salt. Use spatula to combine by hand, or use paddle attachment. Fold in chopped chocolate (you can use all chips or all chunks if preferred) and transfer pumpkin cookie batter into greased skillet. Bake for 20-25 minutes, or until edges are lightly golden. Allow skillet to cool for 10- 15 minutes before slicing into. Serve with your favorite ice cream for a seriously awesome treat. Enjoy! *I used a super thick cashew butter, homemade. You can also sub another nut or seed butter – just make sure it is thick and not drippy. If your butter seems to be on the drippy side, make sure it is really well stirred before combining with other ingredients. **Looking for a vegan option? Try subbing the eggs with 2 TBS flaxseed meal + 6 TBS water and allow the mixture to gel up for about 5 minutes. 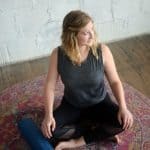 I didn’t test this myself, but let me know if you try! ***I used this almond flour, but also tested with homemade finely ground cashew meal/flour. Tigernut flour may also work, but I haven’t tested myself. You should be able to sub 1:1. ****I am not certain another baking dish would yield the same result, as the cast iron skillet may affect the heat and baking time. If you try with another 10″ baking dish, please let me know! 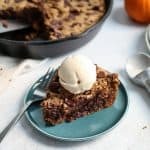 As a lover of cookie cakes and all things pumpkin, I can’t wait to try this! Ok this is pinned, and saved in all possible ways haha I can’t WAIT to try this! 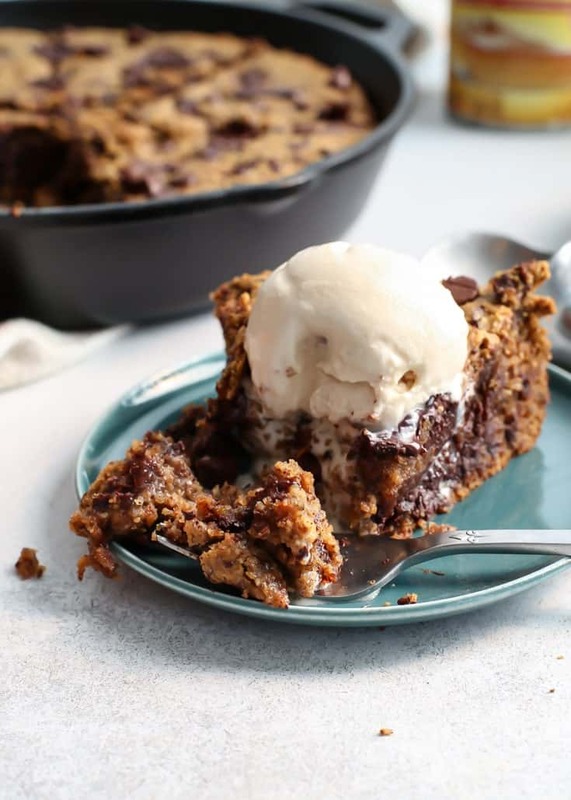 Just when I thought your desserts couldn’t get any more epic you go and make a deep dish cookie that paleo friendly – delsih!! I’ve been stalking this on your IG stories! YUM YUM! I can’t wait to make it! As great as a cookie is, a cookie you eat with utensils and ice cream is the winner! This one looks amazing! Uhhhh chocolate and deep dish. You’ve said some of my favorite things all in one hahaha. Love this! 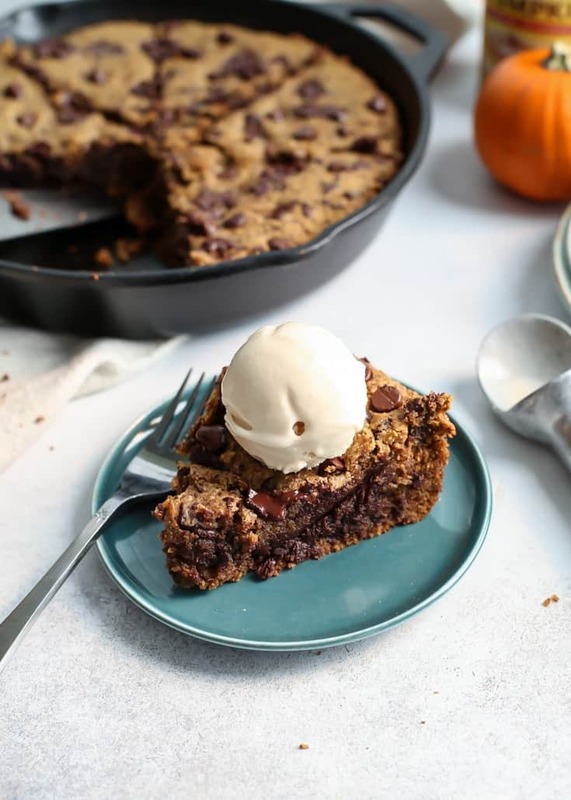 Love a good cast iron cookie, and pumpkin yes please it is that time of year! Had to giggle at leftovers, with my family there ain’t no chance! I mean…. how did you not eat this entire thing in one sitting!?!?!? Yum!! Love that this recipe is paleo and looks SO delicious. I wouldn’t mind having in this in my oven right now! I can definitely try the flax egg substitution with this recipe! It looks SOOOOO good. If I had this in my kitchen, it would be gone in a night! 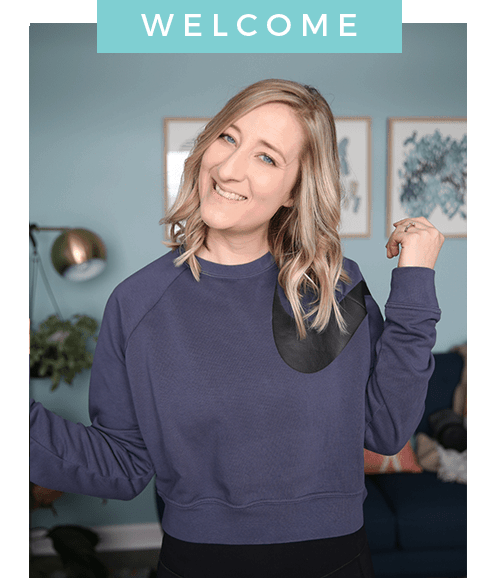 I’m making this recipe for an office game night and can’t waaaait to try it!!! Question: I accidentally bought crunchy almond butter instead of creamy when shopping for this recipe… Could I make that work or should I return? Hi Carlee, you can definitely use the crunchy almond butter as long as you don’t mind that extra texture in there. Keep me posted on how the recipe goes! Hi Rizza 🙂 You can probably sub the Bob’s Red Mill GF 1:1, but I don’t think you’ll need a full 3 cups like the almond flour. My best guess would be maybe 2 1/4 cups of the GF blend? It will change the texture a little bit, but not a whole lot. The batter should be like a super soft sticky cookie dough. Let me know if you decide to try! Ok, I’ll let you know if i do decide to go this route! Thanks so much! Can I substitute the pumpkin for something else? Quite possibly the best thing I have ever put in my mouth. Thanks for the great recipe, Ashley! Made this today and it is really good! I don’t have a big sweet tooth, but sometimes I just really need some “sugar”, and this fits the bill. Wish I could get my husband to try it (Mr. You Can’t Make a Dessert Out of a Vegetable!”), because it makes a lot, but gonna try freezing some of it. Thank you so much for the recipe, looking forward to trying others you have posted! Oh so glad you liked it! And I wish your husband would try it too! This is a hit with everyone at my house (and they’re all about the “real” dessert recipes). Hopefully you can change his mind! 🙂 thanks so much for taking the time to comment and leave a review!